During these cold days of winter I love to put on this easy soup recipe and have it to warm up for lunches or for a simple dinner. This recipe is SO simple-its just 5 ingredients and its truly takes about 10 minutes to get going (assuming you buy the pre peeled butternut). 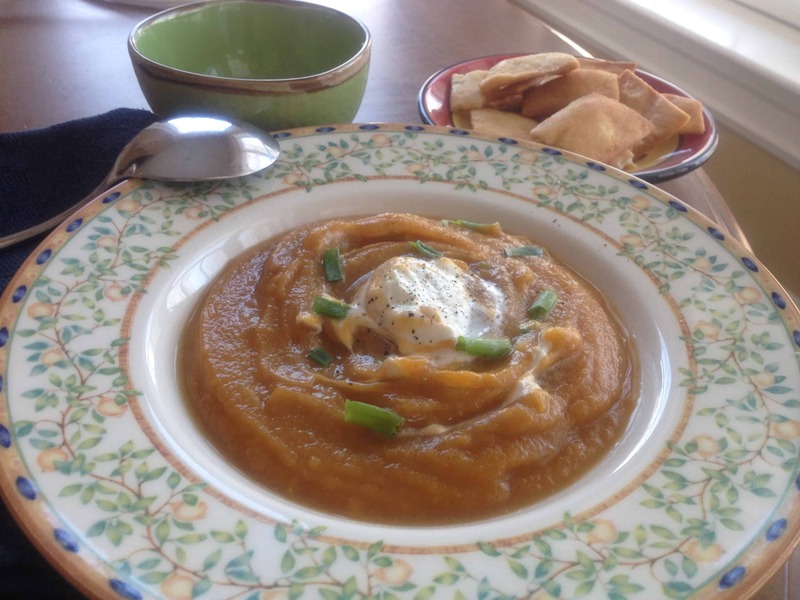 In Australia its called Pumpkin Soup (and its as common there as Tomato Soup is here) and given my husband grew up having this soup frequently, I try to make it often. It also a great starter for a autumn or winter dinner party, to have during a big game (its not too late to put it out for today!) or for your Thanskgiving table (file it away for next year!). The fact that it is so quick and requires so few ingredients makes it a great choice! In large pot, melt butter over medium heat & add onion. Cook 5 – 8 minutes until onion is softened. Add potato, broth, and butternut. Season with salt & pepper. Bring to low boil & simmer for 40 mins until pumpkin & potato are very soft. Remove from heat & let cool slightly. Transfer carefully to blender or food processor & puree a few secs until smooth. Serve in bowls w/ a dollop of sour cream, chopped chives or scallions. Served with a salad and some bread its an easy simple dinner that is nutritious too! Note: this makes a fairly thick soup. If you prefer a thinner consistency, just add some more broth or water.